Canadian art and stories – through a distinctly Canadian art experience. The McMichael Canadian Art Collection offers its visitors a unique and truly Canadian experience. From the art within the gallery on its walls to the surrounding landscape, the McMichael is the perfect gallery for an introduction to Canada’s art, its peoples, their cultures and their history. Renowned for its devotion to collecting only Canadian art, the McMichael permanent collection consists of almost 6,000 artworks by Tom Thomson, the Group of Seven, their contemporaries, and First Nations, Inuit and other artists who have made a contribution to Canada’s artistic heritage. 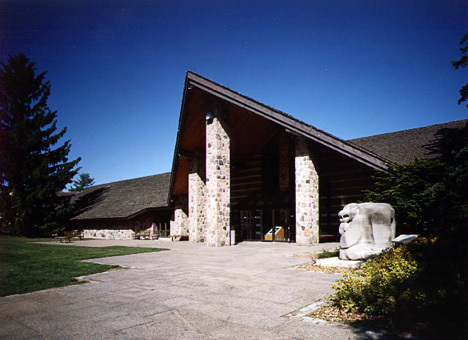 The McMichael Canadian Art Collection is a major public art gallery devoted solely to collecting Canadian art. The gallery offers visitors the unique opportunity to enjoy Canadian landscape paintings in the woodland setting that inspired them. Plus the McMichael brings internationally acclaimed touring exhibitions to its audience, providing a broader context for the collection and also reflecting today’s audience’s higher demand and interest in art. The McMichael’s goal is to bring visitors diverse, creative, high-quality, thought-provoking exhibitions, in order to continually keep its audience engaged and interested. Built of fieldstone and hand-hewn logs, the McMichael houses thirteen exhibition galleries and is situated amid 100 acres of serene conservation land. Floor-to-ceiling windows enable visitors to enjoy marvellous views of the densely wooded Humber River Valley. Through a network of outdoor paths and hiking trails, visitors can discover outdoor sculptures and wander the McMichael Cemetery where six Group of Seven members and gallery co-founders Robert and Signe McMichael have been laid to rest. Experience Canada in a day at the McMichael Canadian Art Collection. The McMichael gallery is located in the village of Kleinburg, just minutes north of Toronto. Beyond the signature fieldstone gates, you will find outdoor art, four floors of gallery and program space, including the Library and Archives, the Gallery Shop, and in-house restaurant Aura by Cashew & Clive – all surrounded by 100 acres of beautiful conservation land which you can explore through a network of paths and trails.